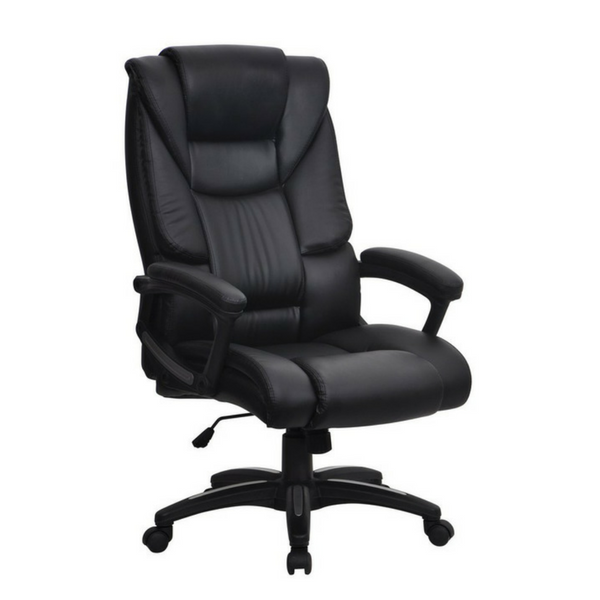 This is an oversized manager style office chair with an extra wide seat and heavy duty mechanism. The hard wearing leather effect finish makes the Tibor easy to keep clean in even the harshest of environments and also makes this the ideal chair for the user who wants a large comfortable chair at a buget price. Fully reclining tilt mechanism, lockable in the upright position. You do wonder whether the chair is as good as the picture, well it is. Really happy with this chair. Quick and easy to put together. Nice sturdy chair with padded armrests and very comfortable to sit on. The leather finish is nice too. Absolutely Amazing Deal. If you are currently looking for a comfortable, well-built chair then look no further. Easy to build and is a pleasure to use. The lower back of the chair protrudes so that it supports my lower spine and it feels amazing. I am around 18st and this chair feels way more sturdy than my previous one. The service was quick and all of the parts were in good condition ready to assemble. I do recommend having another person to help fit the back in place but other than that it was straightforward. I'm not usually the type to write reviews but this chair is great value for the sheer quality you get. The base is heavy and so is the chair, this is because of the strong metals and plastics used to give this chair it's whole heavy duty purpose that is promised. Look no further this chair is a delight!